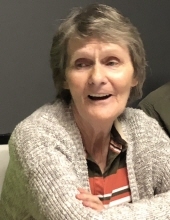 Judith Lane Talandis, 68, of Harrisburg, Illinois passed away on Thursday, March 28, 2019 at Deaconess Gateway Hospital in Evansville, Indiana. She was born on January 28, 1951 in Carrier Mills, Illinois to Andrew and Edith Reynolds Griffith. She was married to Walter Talandis and was a member of St. Mary’s Catholic Church in Harrisburg, Illinois. Surviving Judith is her husband, Walter. Son, Larry and wife Sharon Talandis of Galatia, Illinois. Sister, Ann Tedford of Eldorado, Illinois. Grandchildren, Danielle Sutterfield, Britney Bryant, Laura Talandis, Hunter Talandis, and Brooklyn Talandis; and 5 great grandchildren. She was preceded in death by her parents. Son, Walter Talandis III. Brothers, Tom Griffith, Mike Riley, Ray Riley. Sisters, Ruby Autin, Barbara Hurd, Doris Stone, and Nellie Pritchett. Grandson, Larry Talandis, Jr.
Funeral services will be 1:00 PM Monday, April 1, 2019 at the St. Mary’s Catholic Church in Harrisburg, Illinois with Fr. Abraham Adejoh officiating. Burial will follow in Sunset Garden Cemetery in Harrisburg, Illinois. Friends may call from 11:00 AM to 1:00 PM at St. Mary’s Catholic Church. Arrangements have been made by J. M. Weirauch Funeral Home. To send flowers or a remembrance gift to the family of Judith Lane Talandis, please visit our Tribute Store. "Email Address" would like to share the life celebration of Judith Lane Talandis. Click on the "link" to go to share a favorite memory or leave a condolence message for the family.